What if politics as we know it is about to end? What if humanity soon organizes itself not in hierarchies, but in hive minds? What if society’s mediating structures—education, media, and financial institutions—are about to be completely transformed? Welcome to The Social Singularity. In this decentralization manifesto, futurist Max Borders shows that humanity is already building systems that will “underthrow” great centers of power. Exploring the promise of a decentralized world, Borders says we will: - Reorganize to collaborate and compete with AI; - Operate within networks of superior collective intelligence; - Rediscover our humanity and embrace values for an age of connection. With lively prose, Borders takes us on a tour of modern pagan festivals, cities of the future, and radically new ways to organize society. In so doing, he examines trends likely to revolutionize the ways we live and work. 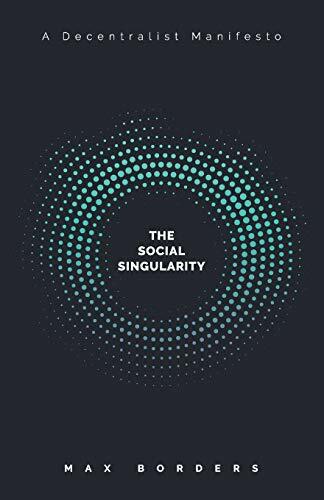 Although the technological singularity fast approaches, Borders argues, a parallel process of human reorganization will allow us to reap enormous benefits. The paradox? Our billion little acts of subversion will help us lead richer, healthier lives—and avoid the robot apocalypse.